Did you hear? 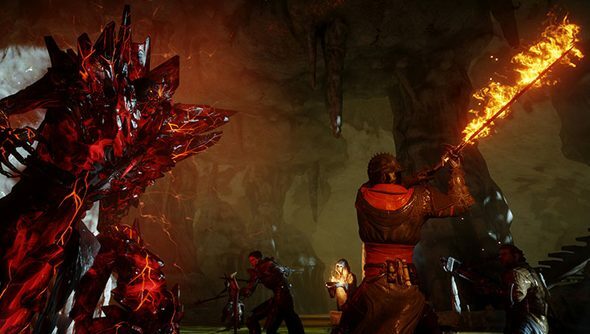 Dragon Age: Inquisition has a four-player co-op dungeon-crawling mode. Gasp. The more you think about it, actually, the less surprising it gets. There’s precedent set by The Old Republic’s co-op Flashpoints, the recently-announced Shadow Realms and, in particular, the surprising success of Mass Effect 3’s multiplayer. It’s Mass Effect that BioWare Edmonton are looking to match and outdo in Inquisition’s loot-driven diversion. They have months of updates planned. For everything we know about the launch check our Dragon Age: Inquisition guide. BioWare told Destructoid that they plan to support Dragon Age: Inquisition’s four-player mode “far beyond Mass Effect 3”. The developers said they have “a lot of content” planned to follow Inquisition’s release on November 21 – free updates that will last “months on end”. Three ‘campaign’ levels will be released for Inquisition’s multiplayer component in November – some Elven Ruins, an Orlesian palace, and a slice of nasty magocracy Tevinter. Each time they’re played, the game will randomly assemble the level using five of ten possible areas. Players will pick from nine hero characters – three fighters, three archers and three mages – and level them up separately from their single player game. But BioWare have promised new levels and hero types in the months after release. They’re also hoping to boost longevity with objectives not unlike those seen in Diablo 3’s Seasons system. Operations see the entire community band together to reach a goal, and Prestige objectives will reward players with cosmetics for completing their own tasks. It’s not all funded by the box fee: there’ll be opportunities for progress-accelerating microtransactions, though nothing will be paywalled. Is this multiplayer as you’d imagined it for Dragon Age? Or would you prefer Divinity: Original Sin style co-op in the main campaign?